On this most auspicious day, we not only remember the tragic events of September 11, 2001, but we also begin the American Dream Reconsidered Conference here at Roosevelt University. There are many sessions focusing on this topic and social justice. Click here for more information; in addition, many sessions will be simulcast online. We are curious about your perceptions and experiences of the American Dream. With that said, please respond to the following questions. How does your earning a graduate degree play support your attainment of your personal American Dream? If you attended the conference, please share what you learned. National Center for Education Statistics. 120 Years of American Education: A Statistical Portrait. Retrieved September 11, 2017. For me the american means assuring everyone equal opportunities regardless of race color or creed. Attaining this degree would mean i will have reached the highest level of education of anyone in my immediate family. To me, the American Dream has always meant that if you work hard, you can achieve anything you put your mind to. If you want something badly enough, you can make that happen for yourself. My personal experiences throughout my career have led me to question the validity of the American Dream concept. As an able-bodied, caucasian, cisgender male, I have to recognize the privilege that comes attached to my version of the American Dream as opposed to someone else who doesn’t belong to those groups. At the end of the day, because we do not all start on equal “playing fields,” and because some of us do not have the resources to simply work harder to make something happen for ourselves, I have become a bit jaded to the American Dream. My graduate degree will make me the first in my family to earn such a degree. It will make me a marketable, competitive applicant to many jobs that I wish to pursue, and puts me a step ahead in attaining my version of the American Dream. Having this degree gives me higher earning potential, thus more able to make my dreams for the future into realities. I enjoyed watching the CBS news clip when Justice Ruth Ginsburg’s response to the question, “How many women should sit on the Supreme Court?” She answered, “There will be enough when there are 9”. Drawing laughter and loud applause. I have witnessed many changes in this great country of ours and hearing Justice Ginsburg is a testament of everything is possible in this country. My American dream is you can achieve anything if you set your mind and heart to the goal. I have a bit of a more cynical point of view towards the American Dream and this is largely due to my undergraduate study of social justice at Roosevelt. In many ways I lived in a bubble of cognizant dissonance as I had many privileges awarded to me in our society for no real reason. it wasn’t until I was part of a marginalized group of people that I began to understand the plight of others in this regard. After formal study I have concluded that the American Dream is dead and perhaps never actually existed for the vast majority of people in our society. The American Dream represents a hope that has driven us forward as a country but is fallacy for many as our society is plagued with so many issues such as racism, sexism, ageism, xenophobia, homophobia/biphobia/transphobia and the list goes on and on. On a more positive note I believe we are beginning to transcend many of these complex issues though far too slowly for too many sadly. Still, progress should not be discounted and I do have high hopes for the future of our country and future generations. Social progress continues to march forward and I am proud to be a part of that progression. My graduate degree has assisted me in breaking into a new industry that has begun to raise me into the upper middle class of our society. While I do not have desires to be rich in terms of financial wealth, I will live a comfortable life with all my essential needs being met. For this I am grateful and I certainly had some help along the way. I hope to one day pay it forward and help others attain higher education so new doors may open for them as well. The American Dream for me is having equal rights for all Americans. I’m African American and often find it difficult to compete in today’s work society. Not because I can’t (I have the resume and college degree), I’m very capable of competing in the workforce but I’m often looked at differently at times because of the color of my skin. I’m very education, attended Catholic School majority of my entire life but I’m often judged. I want to be judged on my work ethic not the color of my skin. I want to set the bar high for my children, so I decided to return the school to pursue my Master’s degree. For my children, I want the American Dream to represent that they can achieve anything they put their mind to. I was to be a guide for their future. For years, we have been told what the American Dream is and I appreciate how Roosevelt took an opportunity to turn a negative into a positive by getting people to renew their dreams and live their best life despite how September 11th has forever been marked in our history. I have to be honest and say looking back on my life the course has changed but the dream remained the same. Part of my dream has always been to be an educated woman into today’s society to show growth and leadership to those that follow behind me. So I can truly say I am living my dream. The American Dream? What does it mean to me? Well, as a seasoned woman who is currently on assignment deployed to aid a citizens of a country where I show up to offer help, but yet I am called a N!&&#$, told that help is not wanted from a N!&&#$ and not to come back. I can’t help but to reflect on the my ancestors who died for me to have the freedoms (but are they really freedoms) that I am suppose to have. Then I thought about people like the Roosevelt’s who wanted equality for all badly. But of course, how could I not point out over the last 9 years the hatred for our previous president bought so much that we’ve supposedly overcame back to the forefront. But, I’ll stop here with that. As far as what my graduate degree will do, well I don’t think education will stop the rapidly moving train of hatred that is moving swiftly through this country. But what I can say is, I dream of an America where my 24 year old son can get stopped by a police officer and not fear for his life. I dream of an America where my brown brothers and sisters won’t have to fear being torn from their families that may have taken a different route to citizenship. I dream of an America where all evidence of racial divide is removed and there’s judicial l equality for all. But until then, I’ll dream that the nightmare in this country will end soon. The American dream to me means more then obtaining a degree and living a happy peaceful life. Given the current climate that face American people and there values today, I must redirect the meaning of dreaming in America. This country was founded on the principles of equality and liberty for all people, not only here in the states, but in its echoes that have traveled across the globe and through time. As of late those echoes have dissipated and it is up to us, the young, educated conservative and liberal generation to smash the liberty bells of freedom so that its sound can reverberate around the world once more. If we remember our history well, Franklin D Roosevelt was the first Democratic President that received the majority support from African Americans. He was the inaugural president from which the African American Community moved away from the Republican party. A divide that was entrenched in racial tensions. At this time America faced the great depression, by in which African Americans were disproportionately affected by unemployment. Roosevelt’s “New Deal,” was a series of economic programs intended to offer relief to the unemployed and recovery of the national economy. Though African Americans were not the intended audience for these programs, they benefitted as many citizens did. Eventually, Roosevelt came around due to the urging of his beloved wifed Eleanor Roosevelt who had much sympathy for the African American struggle began to influence her husband and as a result he moved to urge the FBI to enforce anti-lynching laws. I make this my point because, the very institute to which this article is posted stands on the principles of social justice. Education is only as good as we allow it to be. Today, we are so entrenched in getting ahead we forget what values this country has worked so hard to achieve. Lydon B Johnson is another figure. The political climate has forced us to become blind, so much so that we work only work toward our goals as individuals rather than progress as a society. To answer the question, a Graduate degree allows me to position myself on a level playing field. With this degree maybe I can justify my articulation for equality in the social and economic world. Maybe my knowledge will give my world views and words credence. The American dream means anything is possible and we all have an opportunity to achieve through hard work and determination. Education is often the key that unlocks doors for people. Obtaining an education provides a strong foundation to build upon. Getting a Master’s has long been on my radar screen. I thought….someday, perhaps, maybe……and then life happened! I’m glad I took action and began working toward accomplishing a longtime goal. Knowledge is power and education enhances ones knowledge. These strengths help position us for success in the workplace, classroom, and throughout our communities. In addition, part of the American Dream is about being our best self. My graduate studies are contributing to me being the best I can be! I attended a couple of conference sessions. 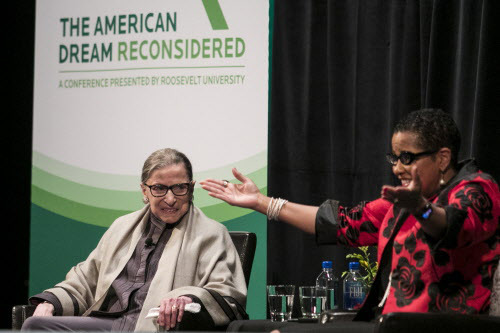 I thoroughly enjoyed the Ruth Bader Ginsburg conversation! I was hanging on every single word that she spoke. What a life she has lived and still going strong! It was encouraging and fulfilling to learn more about her journey. What an amazing trailblazer and inspiration. The American Dream means having a good Job with well enough benefits that could also help support me and my family. and also that would possible help lead me onto my career for my family, such as owning me a nice home that I can afford and a car that is reasonable and being able to travel when I want with my family. The American Dream in all mean just for me to be able to enjoy life itself and others, without worrying about the next day to live or pay my bills but being able to be comfortable to life. Earning a graduate degree plays a big role of support attainment for my personal dream. Because it has support me and guide me into many directions and being in the professional world it gives me more advantage to more options in life than others who may not have decide to earn or receive a degree. It means that I’m living a comfortable life with my family. I am able to buy a home, car, and take vacations with a good job. Reality, no one really knows what that means. Everyone struggles day to day to make ends meet. We go to school to get degrees to make a better living for ourselves and family. The American Dream to me is to be able to survive. It just give me a little edge over the competition. The American Dream is the notion that if you work hard, anything is possible. For some, working hard is enough. For others, even with hard work and determination, dreams are more difficult to reach. Our country is built on privilege. While it shifts from time to time, getting what you want or what you think you deserve is often predetermined. During Ruth’s talk, she explained that barriers can be turned into opportunities. Her dream was to work in Law. Had she been able to take a practical path to being a partner in a law firm, she may have done that and retired early. Because of the road blocks, the way she had to break down barriers, she was able to persevere and become the second female Supreme Court Justice. She is a role model to us all. I’m the youngest of five and was the first person in my family to graduate college. This December, I hope to be the first to earn a graduate degree. That is my American Dream realized. I knew I didn’t want to stay home and have kids. I wanted to travel, learn, and experience the world – then decide when, and if, I wanted to parent. Listening to Ruth share her experience as women fighting for progress for all was truly inspiring. As my time as a student comes to an end at Roosevelt, I will look back at that night as a highlight of my life. She made me grateful for the opportunities I have, and want to continue fighting to make sure more and more people have access to the opportunities that will help ensure they too get to see their American Dream realized – for good, for all.